Spell check is a feature of Microsoft Word that almost everyone knows about, but seemingly very few people use! The internet is littered with poorly spelled writing which could have easily been avoided if the author had used this simple feature. There are two main ways that spell check can help you – ‘Spelling and Grammar’ and ‘AutoCorrect’. In Word 2003 or earlier simply click on the button with ‘ABC’ and a blue tick on it, or go to the Tools menu and select ‘Spelling and Grammar’. 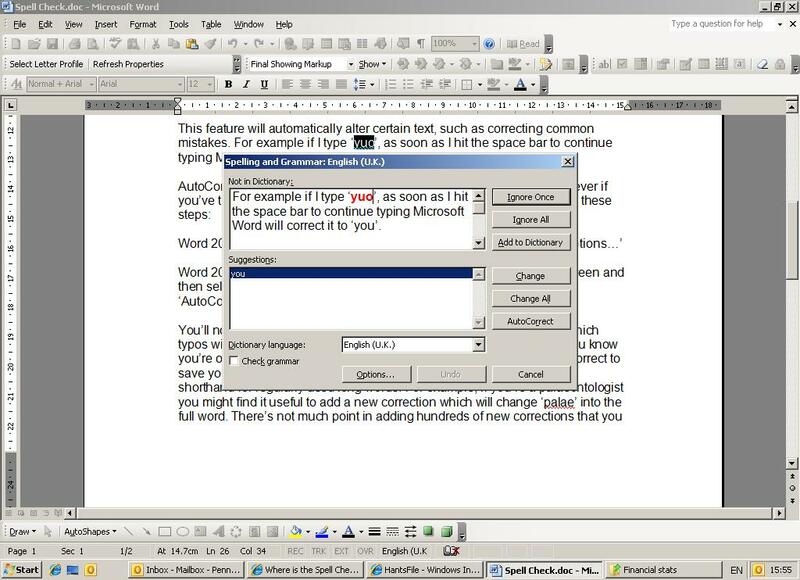 In Word 2007 or later select the review tab in the ribbon at the top of the screen and click on the ‘Spelling and Grammar’ button. As you can see, I’ve run a spell check on the AutoCorrect page from this site and it’s turned up a typo that I’ve used as an example. When Word finds a word or sentence that it believes to include a typo or grammatical error it will offer you various suggestions. You’ll probably find that most times it’s just a small typo and you can happily select the suggestion you want to use and hit the ‘Change’ button to make the correction. In some cases you may not have made a mistake, but Word doesn’t recognised the text you’ve entered – For example foreign words, unusual names, etc. In these cases you can just hit the ‘Ignore’ button. You’ll noticed that you have the option to apply your decision throughout your document by clicking ‘Change all’ or ‘Ignore all’. If you do this Word will apply the ignore or change command to every instance throughout the document with an identical spelling. Finally if you’ve used an unrecognised word that you plan to use again in future you have the option to add that word to the dictionary used by your version of Microsoft Word. If you do this the spelling you’ve used will never again be highlighted as incorrect, in this document or in any other you might create in the future. So that’s it! Used in conjunction with AutoCorrect this is a very useful feature that can save you a lot of headache if you apply it to every document you create. I hope you’ve found this Spell Check Tutorial helpful, please feel free to leave me feedback by completing the form at the bottom of the page.